In the 1960s and 70s, the red-eared slider turtle was the “it” pet to have. These little turtles were very popular with children, until it was found out that these trendy pets shed salmonella. Children were becoming infected when they touched the turtles and put their fingers in their mouths or when they put the whole turtles in their mouths. (I totally don’t remember doing this.) Every year, there were about 100,000 cases of salmonella sickness due to baby turtles or other pet reptiles. In 1975, the FDA banned the sale of these turtles. After the ban, the number of salmonella cases decreased by 25%. Now, Democratic Senator Mary Landrieu of Louisiana says it is time to lift the ban on these baby turtles because of a new technology that was developed. She says that the Siebeling Method disinfects turtle eggs, so baby turtles will be free of salmonella. Senator Landrieu has introduced an amendment to the FDA Revitalization Act to permit their sale. States would have to issue a certificate of sanitization signed by a federally certified veterinarian to guarantee that turtles being sold have been treated by the Siebeling or a similar method. The FDA says that although the method does drastically reduce the presence of salmonella on the turtle, it does not eliminate it. 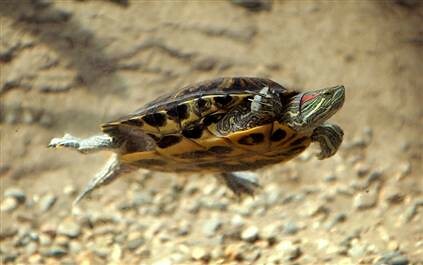 Turtles can continue to shed salmonella through their lifetime. The Humane Society of the United States would like to see the ban remain in place because of health risks, and they say that many turtles die during the poor shipping process, and many people release these turtles into the wild which can lead to a spread of disease and parasites to wild turtles. The House is expected to vote on the amendment today. This entry was posted on Thursday, June 14th, 2007 at 6:54 am	and is filed under Other Pets, National Dog, Cat & Pet Info, Products & Services for Cats & Dogs, News for Cats, Dogs & Owners. You can follow any responses to this entry through the RSS 2.0 feed. Both comments and pings are currently closed. I agree with the HSUS on this one. I cringe every time I see the latest fad pet, knowing many if not most will end up dead or dumped at a shelter. Easter is a special horror, with all the baby chicks and bunnies being given as pets. Well, I was one of those kids back in the 60s & 70s that had 2 red eared turtles. I had a terrarium setup for them with large water bowl set in the dirt, live plants & light bulb. I also had 2 chameleons in there. I had them for years until after I graduated high school and gave the setup to the biology class who also had an iguana. I never got salmonella and I know I rarely washed my hands after touching them. What about all the reptiles people have? They’re not dropping over like flies. I really think the stupid government makes it out to be bigger than it is. There’s probably more danger in eating the FDA GOVERNMENT inspected meat. My BIGGEST CONCERN is what they are proposing will further increase antibiotic resistant strains of bacteria causing a very serious human health risk. Widespread use of gentamicin on turtle farms to produce Salmonella-Uoe eggs for export apparently encouraged development of antibiotic resistance in bacterial strains. Of 37 Salmonella strains isolated in this study, 30 (81%) were gentamicin resistant. Such high levels of antibiotic-resistant salmonellae in turtle eggs pose a serious human health risk. Further marketing of turtle eggs and hatchlings should be curtailed until consistent production and distribution of Salmonella-Uee stocks can be assured. (1) Â ”Antibiotic” means any bactericide or other organic substance which can kill bacteria. (8)”Siebeling method” means a process by which turtle eggs are cleaned, their surfaces disinfected, and a bactericide forced through the pores of the shells without violating the natural structural integrity of the shell, thereby rendering the hatchling free of Salmonella, Arizona, or any other species of bacteria harmful to humans or other pet turtles. Cases have been documented where “Salmonella-free turtles” turned out not to be Salmonella-free, after all. But even the original research stated that a small percentage of treated eggs / hatchling were not free of Salmonella. There is also a lack of recent peer-reviewed research to prove the efficacy of the procedures used to produce Salmonella-free turtles. â€¢ The nature of Salmonella infections in turtles: turtles are natural carriers of Salmonella (part of their normal bacterial load in their intestines; they do not get sick from it). Although they often carry Salmonella, turtles do not constantly shed the bacteria in their feces, so even a turtle carrying Salmonella can give a false negative test depending on the timing of the testing. And, because Salmonella is survives pretty well in the environment and turtles are natural carriers, a Salmonella-free turtle can easily become re-infected, especially around other turtles. â€¢ Antibiotic Resistance: when antibiotics are used, most bacteria will be eradicated, but any bacteria that happen to be resistant to the antibiotic survive and multiply, resulting in antibiotic-resistant bacteria. In the past several years, Gentamicin was the antibiotic commonly used in the procedure to produce Salmonella-free turtle eggs. Ultimately, turtles were found that harboured Salmonella and other strains of bacteria that were resistant to Gentamicin as well as some related antibiotics (Plasmid-Mediated High-Level Gentamicin Resistance among Enteric Bacteria Isolated from Pet Turtles in Louisiana). This only makes the situation worse, since bacterial infections resulting from turtles carrying resistant strains could be harder to treat. So, the hunt is on for another treatment to which resistance can’t develop. Careful hygiene is a good rule to follow with any pets. My concern is that owners of Salmonella-free turtles many not be as careful, thinking their turtles are safe (unaware of the chances of reinfection, or other bacteria their turtle could carry). I don’t think Salmonella should prevent people from getting reptiles, but respect for the risks makes them safer. What I found astounding is that, according to the study cited above, 12 million hatchlings a year are exported. 12 million! As turtle farms become more established in Asia, US turtle farmers are again losing their market, and they want the US market opened up again. Before the ban, when baby turtles were hugely popular and very widely available, many turtles perished in the hands of well-meaning owners who knew little about their care. Even today, turtle hatchlings are sold (albeit illegally) along with ridiculously inadequate plastic lagoons as homes. However illogical the ban on turtle hatchling sales might seem, it has had a good side effect of saving hatchling turtles from death due to neglect. Well, maybe not; I suppose the problem has just been exported, and the sale of hatchlings in the US may have been slowed down, but not stopped. Still, I am afraid if the hatchling market opens wide in North America again, it certainly won’t to benefit the turtles. An estimated 70 percent of all antibiotics used in the United States are regularly added to the feed of livestock and poultry that are not sickâ€”a practice with serious consequences for our health. Bacteria that are constantly exposed to antibiotics develop antibiotic resistance. This means that when humans get sick from resistant bacteria, the antibiotics prescribed by doctors donâ€™t work. Sorry folks, but this ban should NOT be lifted. I don’t feel that way because of a possible health risk to people. All reptiles pose some risk of infection and that will never go away completely. The reason there should be no change in the laws on the sale of small turtles is because the mortality rate for turtles sold under a certain size is VERY high. I can’t tell you how many people I’ve seen at my job (in a pet store) who bought these quarter-sized turtles and then killed them because they keep them in tiny fishbowls and they remain stunted until they die VERY prematurely. I have yet to meet someone who bought one of these tiny turtles (NOT at my store, we don’t sell them under 4″) that had any inkling how big a red-eared slider gets, or how long they are supposed to live. They can grow to over a foot in length and live for more than 15 years. It is cruel to keep them in a tiny bowl so they stay only a few inches long. I’ve never met anyone who managed to keep their turtle alive for more than a year or two when they got their turtle that small and kept it so stunted, but what can you expect from someone who bought it on a whim at a beachwear shop on the coast that has no business being allowed to sell live animals at all? Certain animals are not meant to be pets, and do not thrive as pets, such as this turtle. I also believe that snakes which must be fed live animals should be outlawed as pets…they only contribute to the animal cruelty problem as owning and feeding them live captive small animals is intrinsically cruel and instills in the (usually adolsecent) owner a lack of compassion towards living things. There is absolutely no reason for these snakes to be legally kept as pets. Also, when they become too big, they are often released into the open, where they become a menace to neighborhood pets and perhaps even to people. I don’t understand why animal welfare organizations are silent on this matter. Oh good Lord. I remember everyone had them when I was a kid. when they were small. This is not a good idea imho! When I first read the story I wondered why Sen. Landreiu would even care about the turtles until I read the whole story how the The Siebeling method, developed at Louisiana State University in Baton Rouge. Ok the picture just got clearer. What’s in it for the university? More grants, more funding bottom line more money. It’s always about the money. If she wants to help an animal causes she should help people who have lost pets and better laws to help us. But there’s no money in helping the average citizen. Lets clear up some of the myths about baby turtles. If people would have the latest news on the treatment of baby turtles for salmonella they would know that the farmers use a chemical to treat the turtles. There goes the excuse not to lift the ban because of the resistant strain of salmonella. Then there is the issue of some baby turtles that die while in the possesion of the owner. Do you know the mortility rate of the baby turtle in the wild? Probably not because if you did you would know that the baby turtle in the wild has a very very very small chance of survive. This is due to the over protection of other animals such as alligators, racoon, minks the mexican birds that migrate here and other animals that the government over protects. Then there is the widely publicized case of a baby that died in Florida from the moma bathing the baby in the same sink that she washed the turtle bowl in. Do I need to say more about this one. If you believe so strongly that the baby turtle should not be sold in the U.S. then lets stop the sales of all pets in the U.S. Every pet has the potential to carry salmonella or some more dangerous disease. Maybe; just maybe let us use common sense and accept the fact that along with every thing that the consumer buys there comes a responsibility. When the consumer makes a purchase the consumer accept the responsibility. What did the university get out of this. I know the scientists that did the research did it to help the turtle farmers. They did it for the pure pleasure of doing research. That is why they became scientist.